If we as business leaders all know that engaging our employees can have such a positive impact on our customers and stakeholders, why then is employee engagement so elusive? A recent Gallup study that included more than 150,000 interviews found that only 30% of U.S. workers report being “engaged.” That means that more than 2 out of 3 workers are giving less than their best effort at work. At Integris we help organizations launch initiatives aimed at improving effectiveness and efficiency. Some of the most popular techniques include Balanced Scorecard, Net Promoter Score and Lean Six Sigma – all of which can have significant impact on organizational results. But for most organizations, pursuing such initiatives is putting the proverbial cart before the horse. In organizations with high engagement ratios, these methodologies are welcomed by the workforce as tools they can use to perform at a higher level. But for the larger number of companies where the majority of workers are not engaged, such initiatives are anything but welcome. For example, I can’t tell you how many times I’ve heard someone ask if the process improvement approach called “Lean” is an acronym for “Less Employees Are Needed.” Such comments highlight the view so many workers have that approaches like Balanced Scorecard and Lean Six Sigma are simply management’s way of instilling more control. As Jim Collins explained in Good to Great, high performing cultures enable employees to operate with freedom within a framework of responsibilities. The structure that comes from formal initiatives can positively impact employee engagement if leaders use that structure to set a framework of responsibilities… then get out of the way. This is where most organizations stumble, and this is where The Leadership Challenge can offer the greatest value. Respect. Leaders who treat members of their team with dignity and respect. Empowerment. Leaders who are willing to listen to other’s opinions, and empower rather than control or restrict the people on their team. Clarity. Leaders who provide a strong strategic narrative about where the organization is heading. Values. Leaders who build trust by aligning daily behavior with organizational values. These drivers of employee engagement are familiar to you, aren’t they? They are the same leadership behaviors that Jim and Barry have been researching for the past 30 years. Just read the Ten Commitments (sidebar) and think about how closely they align with what these studies report. Find your voice by clarifying you personal values. Envision the future by imagining exciting and ennobling activities. Enlist others in a common vision by appealing to shared aspirations. Recognize contributions by showing appreciation for individual excellence. Over the last few years, LPI participants around the world have been asked to respond to a 10-question Positive Workplace Attitudes (“PWA”) survey after completing the 30-behavioral questions of the LPI. The survey asks respondents to use a 5-point Likert scale to indicate the extent to which they agree or disagree with each of these items. My work group has a strong sense of team spirit. I am proud to tell others that I work for this organization. I am committed to this organization’s success. I would work harder and for longer hours if the job demanded it. I am highly productive in my job. I am clear about what is expected of me in my job. I feel that my organization values my work. I am effective in meeting the demands of my job. Around my workplace, people seem to trust management. I feel like I am making a difference in this organization. 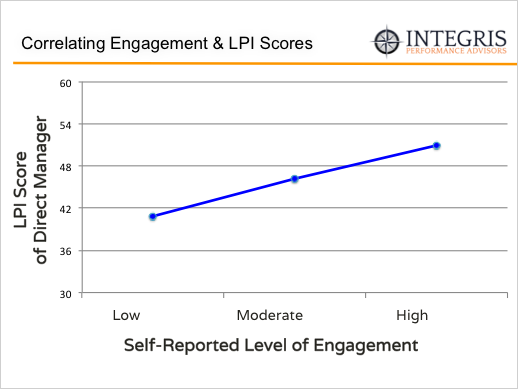 At Integris we are doing our own research on the correlation between LPI and PWA scores using the data from our own client engagements. The graphic shows a trend line for a population of approximately 500 employees who rated their direct manager using the LPI and completed the PWA survey. The data clearly demonstrates a positive correlation between employees’ self-reported levels of engagement with the same employees’ opinions of how frequently their direct managers behave in accordance with the Five Practices of Exemplary Leadership. Conclusion? People are more engaged in the workplace when they witness their direct manager practicing the behaviors associated with The Leadership Challenge. According to a Zenger/Folkman study that appeared in the Harvard Business Review Blog Network (Dec. 2012), the average person takes their first supervisory position around age 30, but doesn’t get their first leadership training until age 42. That means that most new leaders are left to figure it out on their own for over a decade. It’s no wonder leaders in our organizations aren’t influencing higher levels of engagement! As Jim and Barry have been telling us for years, leadership is learnable. But for most people, learning requires training. When did you get your first leadership training? When did you learn about The Leadership Challenge? What has knowing the Five Practices of Exemplary Leadership done for you? If you are like most of us in the TLC Community, the Five Practices have had a profound impact on your job, your career or maybe even your life. By being familiar with the concepts of The Leadership Challenge, you already have more knowledge about leadership development than most people in your organization. How are you using that knowledge? Do you keep TLC to yourself, using it as a tool just for your own development? Or do you share the wealth with your colleagues who have not yet had the opportunity to learn what you’ve learned? How much more engaged would your employees be if all the leaders in your company – from the CEO to front line supervisors – more frequently exhibited behaviors aligned with the Five Practices of Exemplary Leadership? The key to employee engagement is already in your hands… now go use it! 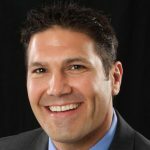 Brett is the visionary President of Integris Performance Advisors, a professional development firm he co-founded to expand the existence of healthy organizations and great places to work. By creatively bringing together concepts from The Five Dysfunctions of a Team (by Patrick Lencioni), The Leadership Challenge (by Jim Kouzes and Barry Posner), and Lean Six Sigma, Brett and his team have influenced thousands of people in government, non-profits and corporate America to work together in more productive, more effective and more human ways. Outside of his role at Integris, Brett dedicates time to serving others in need. He is a volunteer coordinator for the East Bay Stand Down and Stand Down on the Delta, two non-profits serving the needs of San Francisco’s homeless Veteran population. He is also board member and financial sponsor for Partners in Sustainable Learning, whose mission is to bring early childhood education to marginalized communities in the developing world (current projects are underway in Nepal). 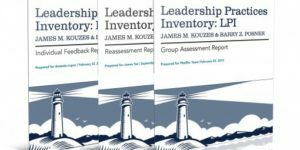 ← What Is The Leadership Practices Inventory® (LPI®)?